The teen years are a time of rapid growth and development, demanding increased energy and nutrients. Unfortunately, many teens are prone to irregular and unhealthy eating habits, caring more about how they look than what they eat. Adolescence is a time of rapid bone growth. Teen girls need added iron to replenish loss during menstrual periods. That’s some of the reasons why we developed Maxi Teen Supreme™ Hers. It will provide her with the basic nutrients needed to grow and develop properly. It fills in where her diet is poor, so that you have one less thing to worry about. Not only will she get the basics, but we have added some very special nutrients such as the trace mineral selenium (for detoxification and antioxidant defense), copper (for healthy bone, collagen, and nerve tissue), pantothenic acid (for healthy metabolism), and much more. Check out the supplement facts tab and see for yourself! 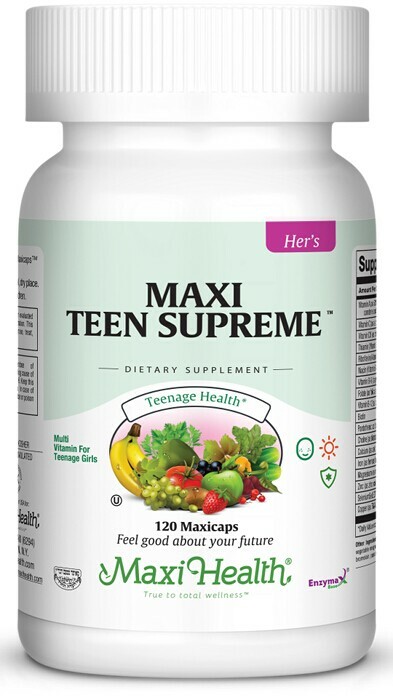 Your teen age girl deserves the best, so chose Maxi’s Teen Supreme™ Hers. Take two (2) MaxiCaps™ daily with meals. Other Ingredients: Vegetable cellulose, rice flour, vegetable magnesium stearate, Enzymax® (calcium carbonate, bromelain, papain, lipase, amylase, protease, silica), chlorophyll. This product contains no wheat, soy, salt, milk, gluten, fish, artificial flavors or colorings. Every day, when I come home from school I feel very weak and tired, and I can't do homework. One day, my mother brought me the Maxi Health Multi and after a few days I saw a major difference in my life.